turret is 14 kilometers from Mahon, is located between Punta de ses Colomar and eagles. Natural Area is part of Special Interest d'Albufera des Grau (70 hectares, an average depth of 1.5 meters and rich scenic, floral and faunal, which helped the Unesco declared October 7, 1993 Menorca Reserve of the Biosphere). The name of this pristine beach, beautiful, sandy slope, comes from the defensive tower of the same name (also called the watchman by the name of Tamarells, referring to the nearby beach), which stands on the ledge is Colomar, 750 meters from Cala de sa Turret. The marine and underwater anchoring boats. This coastal corner belongs to the stretch of coastline between s'Illa ("island") of Colom and Cap de Punta de Capifort Favàrix or two and a half nautical miles high coast, undulating and rocky, which makes your browsing to be full low, blocks and pitfalls. 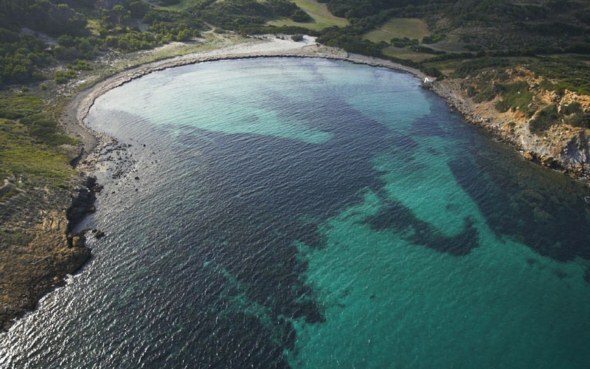 The small coves and inlets scattered between Punta de Fra Bernat (south) and Cap de Mossén Vives, have these natural barriers that interfere with access by sea. characteristics explain the very crowded by locals and tourists. The few visitors who come to this bay by sea do, despite the difficulties. Still, you can access this stretch of coastline walk from Cala des Grau. Please, fill in all the fields marked with (*). HTML code is not permitted. Your email address will NOT be published. Add a review By submitting this form you are accepting the general terms and conditions of this website. You'll always find the best option at the best price! Easy booking process with secure payment gateway. Cancel your reservation for free up to 10 days before. Copyright © 2007-2012 ClickMenorca S.L.N.E. Some rights reserved.